The first five holes are critical to scoring low here. 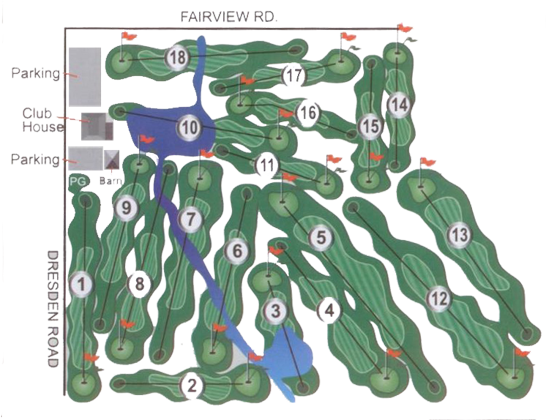 They feature three of the course’s five Par 4 holes. All five are reachable from the tee providing birdie and eagle opportunities. This hole is a dead straight shot from 192 yards, out of bounds to the right and a grass mound on the left. 213 yards with out of bounds again to the right. A creek frames the entire left edge of this hole so you’ve got to be straight here. For many the most menacing hole on the course. 152 yards over a pond to an elevated green. A beautiful and challenging hole. One of the longer Par 3’s on this course at 178 yards you again have to stay straight and be on point with your distance. Large pine trees frame the left side and water is in play if you go right or long. The longest hole on the course at 216 yards. This is a good opportunity and a pretty open, straight fairway. Don’t get too confident though there’s trouble to be found if you get a little left. Another gorgeous hole played from an elevated tee box. 133 yards and you’ve got to have your distance dialed in. A creek runs right through this hole just a few yards from the front of the green so anything short is wet. Go long though and chipping back on will bring the creek back into play as this green slopes right back toward the water. At 169 yards this one is the third longest par 3 on the course. It will test your accuracy and distance. Avoid the right side as there are trees that can cause problems. The green is protected on it’s right side by mounds that cause it to slope drastically downhill, left. Either nail this one or miss it left. 138 yards. Most people will go right at this one with a short iron or wedge. Beware of the creek though….it cut’s diagonally right through this hole allowing for all types of trouble if you hit fat and don’t clear it. Finishing the front 9 you’ll be playing right beside the signature Green Valley Golf Club barn. From 136 yards there’s water from the #10 pond if you go long and that same creek that’s been cutting through the first eight holes runs in front of the green here as well. The recurring theme here is simple: “Be straight and have your distance right”. Enjoy and see you on the back 9. Just like the front 9 you get two good Par 4 opportunity’s in the first three holes of the back 9. This one starts with a great view from way up beside the clubhouse. You’ve got 199 yards and a pond to cover. Not much trouble here just get off the tee good and give yourself a chance to score. From just 127 yards this one definitely is a short iron/wedge hole. The green is a tricky one and will really test your touch with the putter. If you’re long you’ll have a tough downhill putt while anything from the left or right will move drastically back toward the front of the green. Here is the final Par 4 on the course and although it’s the shortest at 185 yards it plays longer than that. The green is perched atop the highest elevation at Green Valley. Once you reach it take a second to enjoy the view. It’s all Par 3’s from here. This one has a quiet, shaded tee box that’s tucked back into the woods a bit. It plays 145 yards with out of bounds to the right. This daunting par 3 is the longest on the course. At 190 yards many consider this to be the toughest hole at Green Valley. Large pine trees line the left side while there’s out of bounds off to the right. The fairway dips down about 40 yards in front of the green which exaggerates it’s elevation but be warned if you wind up above the hole here. From above the hole you’ll find putts that are as difficult as any course, anywhere. Following 14 this short 141 yard Par 3 will give you a chance to catch your breath. Straight and flat with a pretty calm green. This hole epitomizes the old phrase “short but stout”. At just 73 yards and guarded by two grass mounds in front you’ll likely struggle to find the club and the stroke to master this one. Here you tee off from right behind the #10 pond which creates a nice little aura. From just 128 yards this green moves from left to right the whole way. Rounding out this beautiful course is this 141 yard Par 3. The entire right side is out of bounds and about halfway down is a creek that runs back to the #10 pond. You’ll cross over a bridge on your way to the final green and clubhouse.